Here we got the storage of knowledge – a black stone in a transparent solid – the green carpet – a gras roof – covers the most efficient circulation which connects about 100.000 m2 of space. The future architectere of the university – works like an airport. The Vienna University of Economics and Business is the largest university focusing on business and economics in Europe and, in terms of student body, one of the largest universities in Austria. 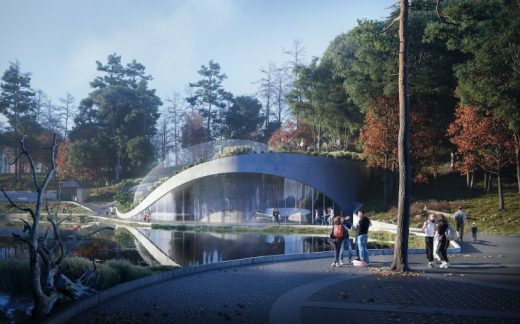 The realization of a new WU campus represents an important step in the university’s development, and a further milestone toward reaching its goal of further improving its top position among European business schools. The central building, the Library & Learning Center, is surrounded by five building complexes designed by internationally renowned architects. 35,000m2 of the campus area is built up, the remaining 55,000 m2 are publicly accessible grounds.